1. Eat a whole raw carrot as a sweetish satisfying snack. It’s low in calories, but relatively filling. Pop one into a lunch box to nibble on when you need it. 2. Cut raw carrots into sticks and use in dips along with other raw vegetables. For instance, try with hummus, garlic dip, tzatziki or salsa. 3. Grate raw carrot and eat as part of a salad. Sprinkle it on the top to add colour, flavour and crunch. 4. Combine raw carrot with one or two other ingredients in a French or mustard dressing. Try it with grated beetroot and sunflower seeds or celery and sultanas or walnuts and chopped spring onions. And then of course it can be combined with shredded white cabbage and mayonnaise to make coleslaw! 5. Good old boiled carrots on their own are still a great accompaniment to traditional meals such as roast dinners and braised steak. Just don’t overcook them, or they will lose their flavour. They’re also delicious mashed with other root vegetables such as potatoes, swede or celeriac. Add a knob of butter and a pinch of nutmeg. 6. Use carrots whole or in large pieces as a key component of vegetable stir fries or oven roasted vegetables. In both cases, cook in olive oil with garlic and maybe some fresh rosemary or thyme. 7. Diced carrots can be added to many main meals to add flavour and bulk. For instance, they will bulk out a shepherd’s pie or curry and team well with most other vegetables and meats. They are an essential ingredient of most winter stews. 8. Cooked and liquidised carrots can form the main ingredient of many beautiful soups. Best known is probably carrot and coriander, but try carrot and apple for an unusually tangy combination. 9. Use carrots in smoothies: they blend well with spinach, apple, apricots and mango. You can experiment to see which other fruits and vegetables combine well, too. 10. 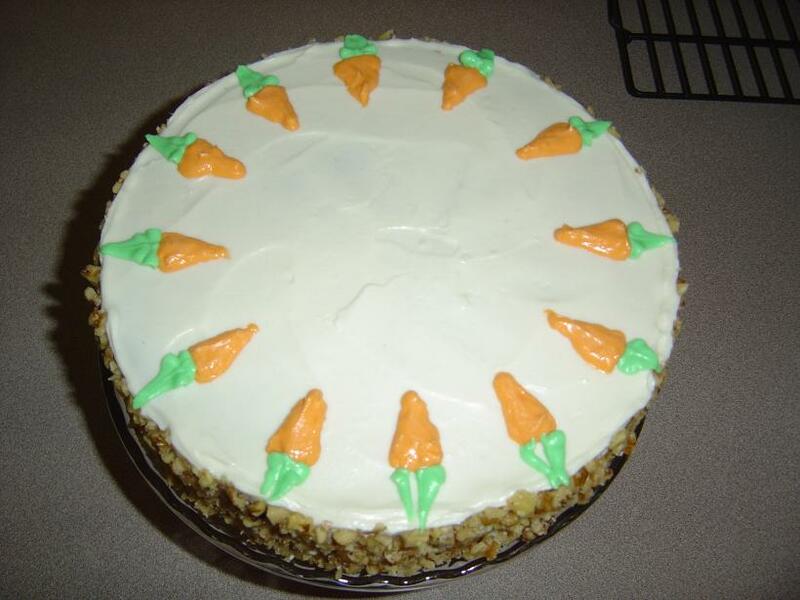 I saved the best till last: carrot cake! Yum. There are many recipes for this. For instance, you can combine 3 large grated carrots, with 175g self-raising flour, 175ml sunflower oil, cinnamon, 3 eggs, 175g sugar and 100g of sultanas or chopped walnuts. Some recipes are baked in a round cake tin while others are baked as two sponges which are sandwiched together with cream cheese frosting. Bake for about 40 minutes on 180 degrees C or Gas mark 4. Not all carrot cakes are frosted, but a lovely frosting is made by combining 225g cream cheese, 110g margarine and 450g icing sugar. You could decorate with walnuts or little carrots made from orange fondant icing.